The Outcross 9060 is an invaluable tool in the long-standing battle Turf Managers face to “do more with less.” This machine is a time-saving, easy-to-use, multi-purpose, turf-friendly powerhouse that brings year-round flexibility, consistency and productivity to turf maintenance operations. Don’t mistake the Outcross 9060 for the agricultural tractors often found on golf courses and sports fields. It is not a tractor! 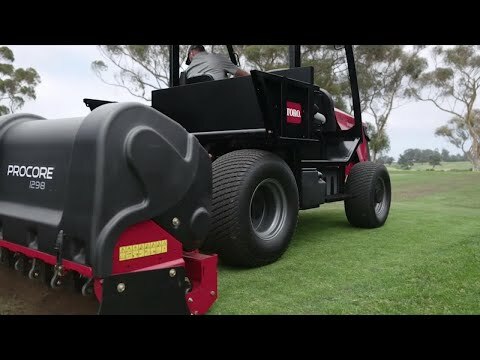 The Outcross 9060 does all the work of a tractor AND a super-duty utility vehicle without the headaches often associated with operating each in turf maintenance applications. Its turf-friendliness, ease-of-use, programmable attachment parameters, and automotive-like controls put the Outcross 9060 in a league of its own. This functionality and versatility gives Outcross users the ability to replace two or three pieces of equipment with one Outcross, and still do more.